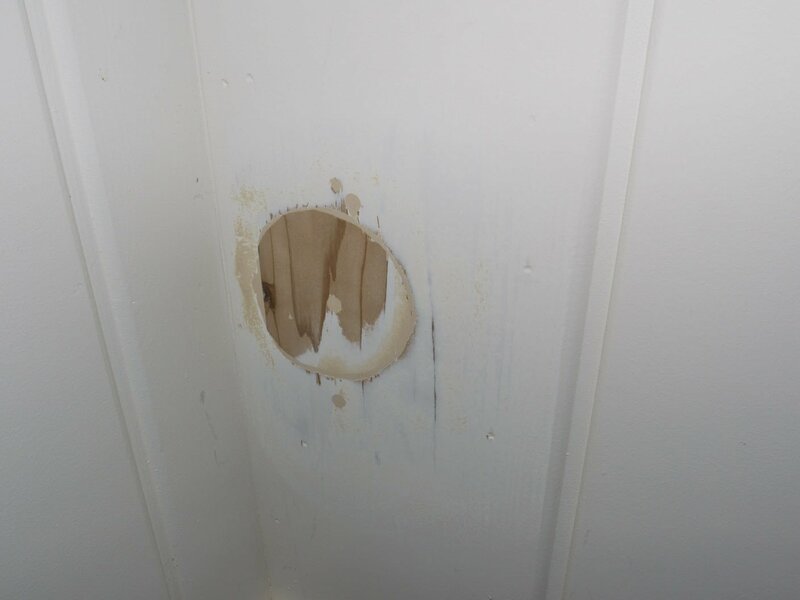 Over the years, the cabin walls have accumulated quite a collection of holes. From electrical box cut-outs to old heating system vents, there is ten cut outs of various sizes throughout our cabin interior cedar walls. The original owners used a variety of patches over the years to cover the deficits, but it was time to pull off the patches and fix them all for good. 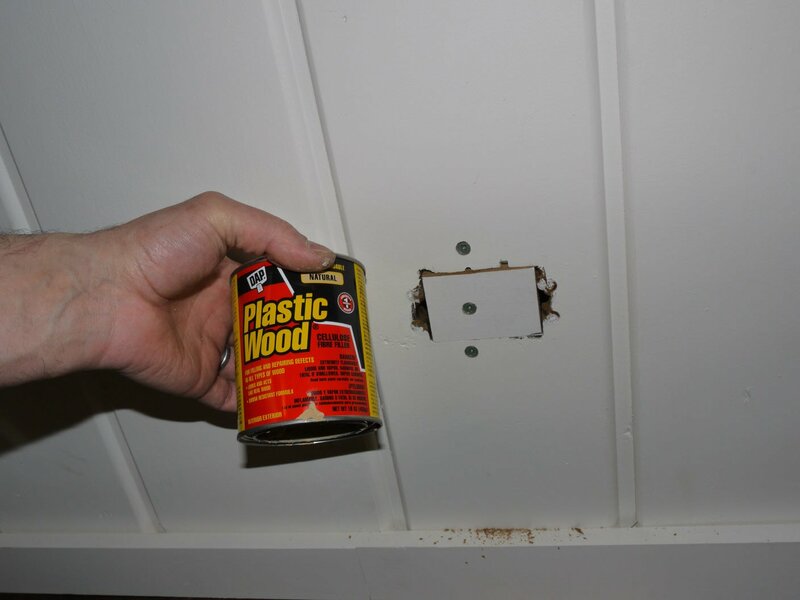 This discussion walks through a step by step approach to repairing holes in interior wood-paneled walls. For the cabin walls, I was lucky to have a stock of the original cedar paneling boards to use as patch material. 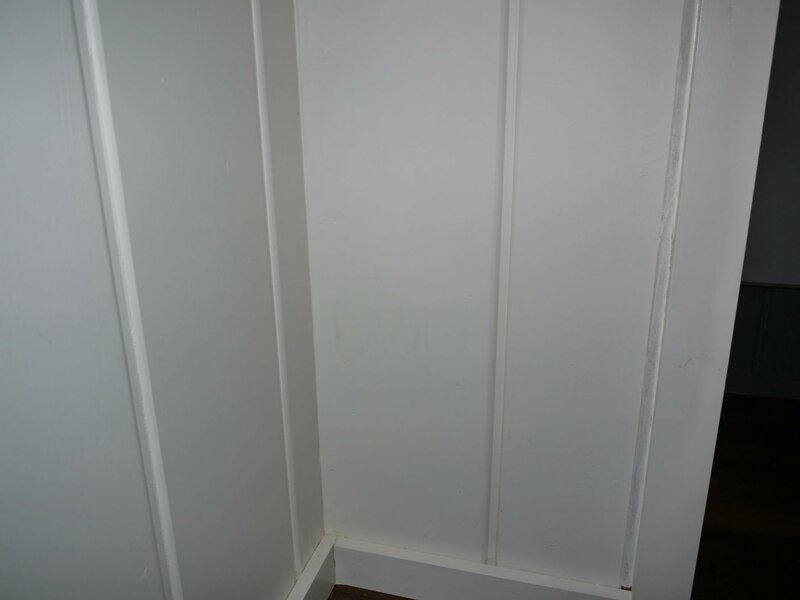 Finding a patch material that matches the thickness of the existing wall material is key, and what could be better than having spare stock of the original paneling? My basic strategy for repairing the panel holes is to mount a slightly under-sized patch within the defect and then fill in any remaining deficit with a solvent-based wood filler. For the wood filler, I like Plastic Wood® brand. I tried many types of wood filler and found the durability and short drying time of Plastic Wood hard to beat. To finish the repair, I used an orbital sander, once the wood filler was cured, to level. Finally, the repair was finished to match the existing walls – in my case latex paint. 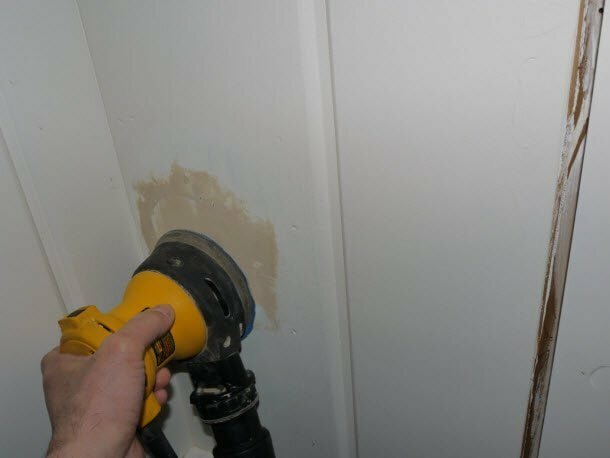 The principal of repairing a wall with a braced patch plus sanded filler can be used to repair a variety of deficits in wall constructed from many different materials. 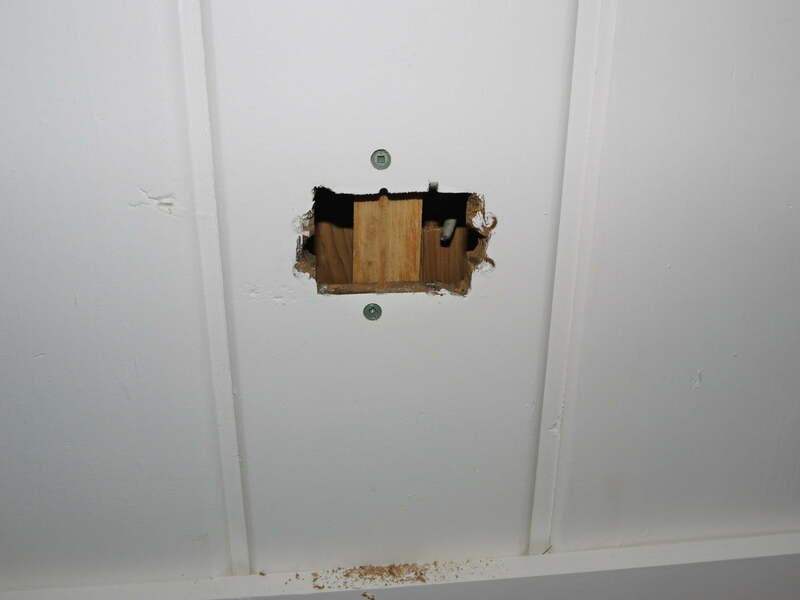 Dry wall is repaired using the same process, just substitute a sheet rock patch and plaster for the wood patch and filler. 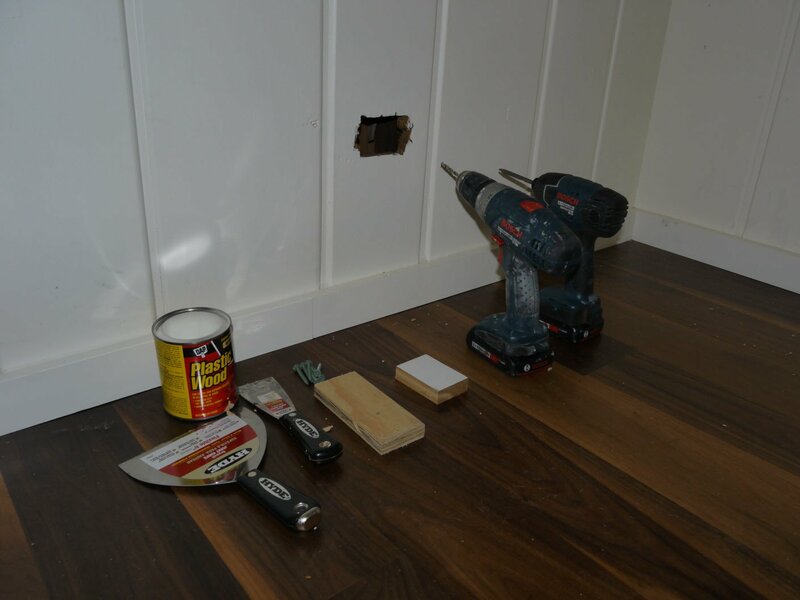 Gather the wall repair supplies including; wall patch, brace material (plywood scrap works well), filler material, drywall knives, sanding supplies and paint or finish as needed to match the existing finish. 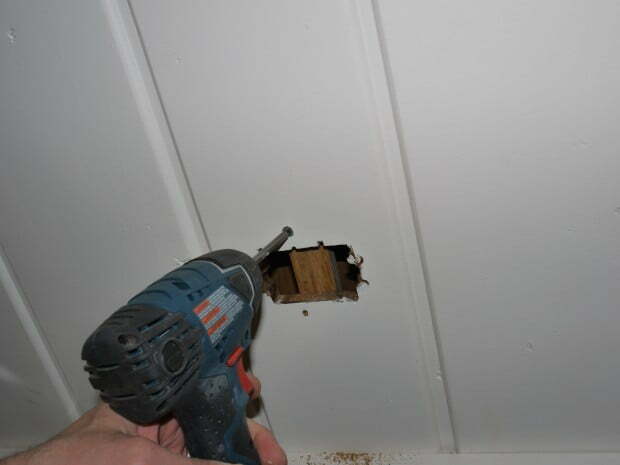 Prepare wall hole for repair and install plywood brace. Remove any loose material from hole and hole edges. Drill pilot holes on two or more sides of the wall deficit to use to attach the bracing material placed behind the deficit. Next, pass bracing material through the deficit and position it flat against the back of the wall. 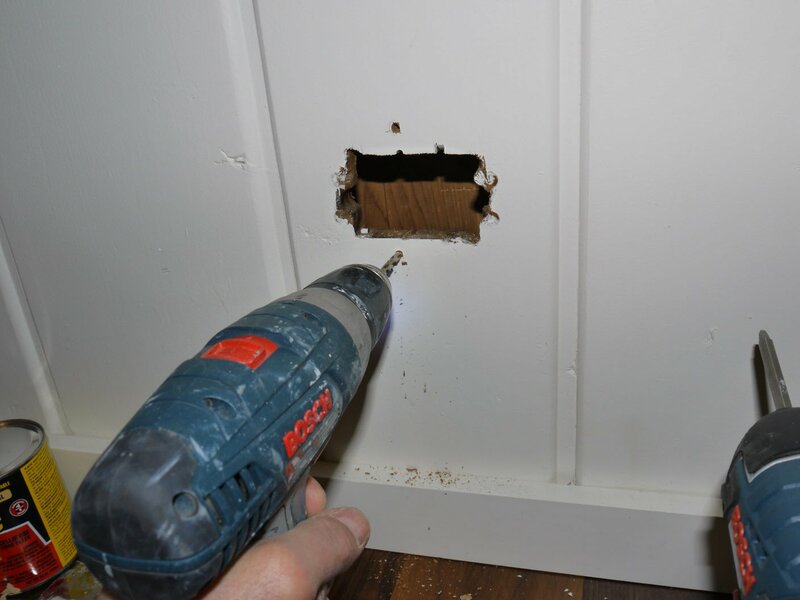 The material should overlap the hole behind the wall enough to allow passing screws through the previously drilled holes into the brace – typically 1 -2 inches of overlap on both sides of the deficit is enough. After the plywood brace is in place, drill through the existing pilot holes to extend the pilot holes into the brace material (this will make passing the screws into the brace much easier). 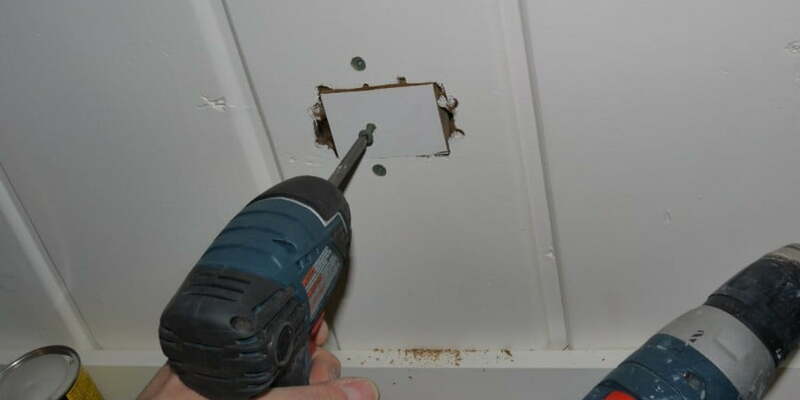 Then drive drywall screws through the pilot holes into the brace material to secure the brace. 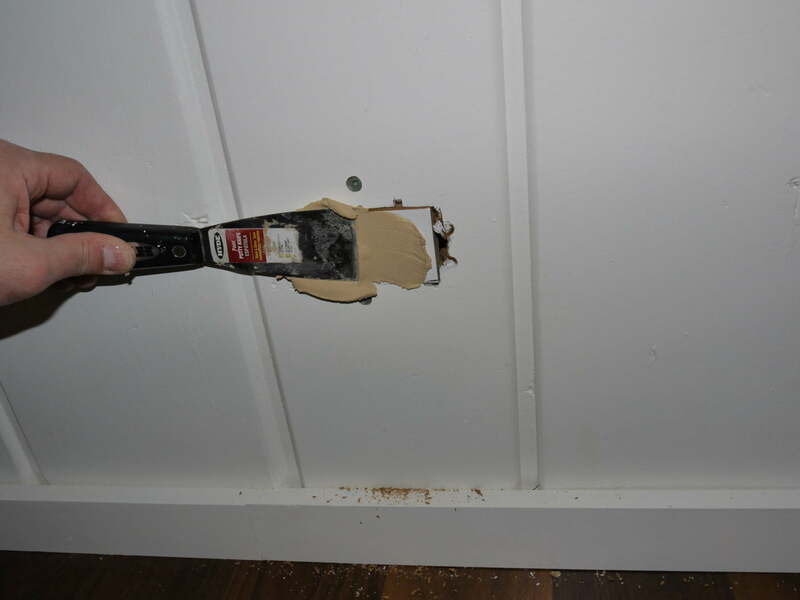 Overdrive the screws into the wall face by 1/8 – 1/4 inch to allow wood filler to cover the screw heads. 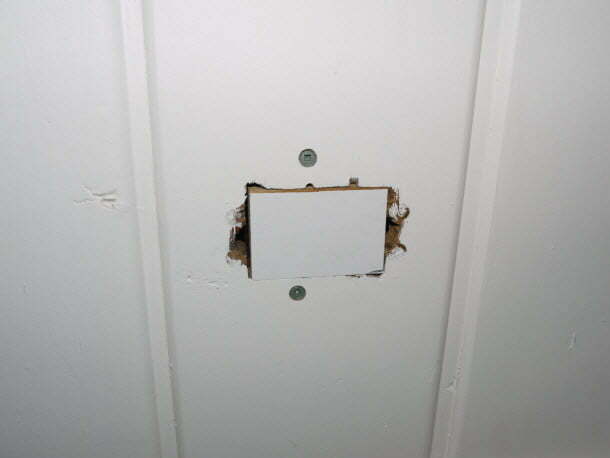 Using a piece of scrap plywood mounted flush against the back side of the wall behind the hole as a frame for the patching material. 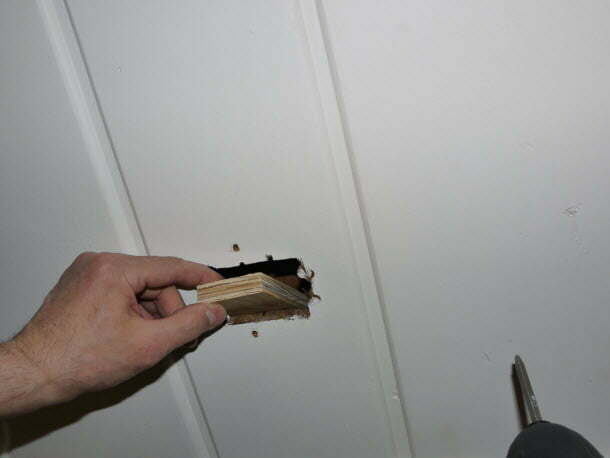 Securing wall plywood brace behind wall defect using drywall screws. Cut and install wall patch material. Using a material of the same thickness (ideally, the same material) cut a patch to fill in most of the deficit. I was able to use the same cedar boards for the patches as I had a stock of several old boards removed in other parts of the house. The patch need not fit perfectly in the wall deficit, but should be flush with the wall surface. Brace material fastened to backside of wall hole using drywall screws — notice counter sink of the screw head to allow for filler coverage. 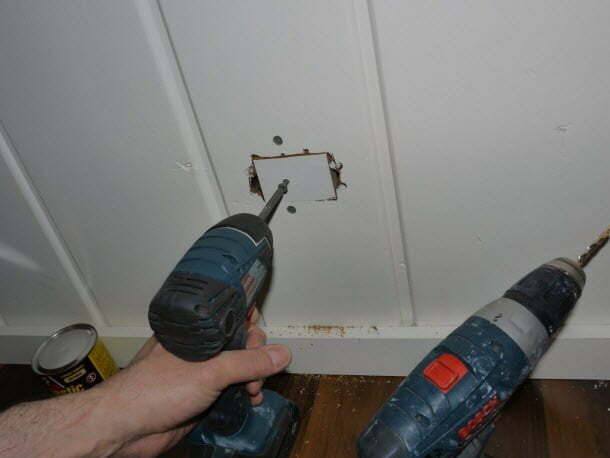 Once the wall patch is in place, secure this patch by screwing it to the previously placed brace by drilling a pilot hole and then passing a screw. Again, countersink this screw head to allow for wood filler coverage. 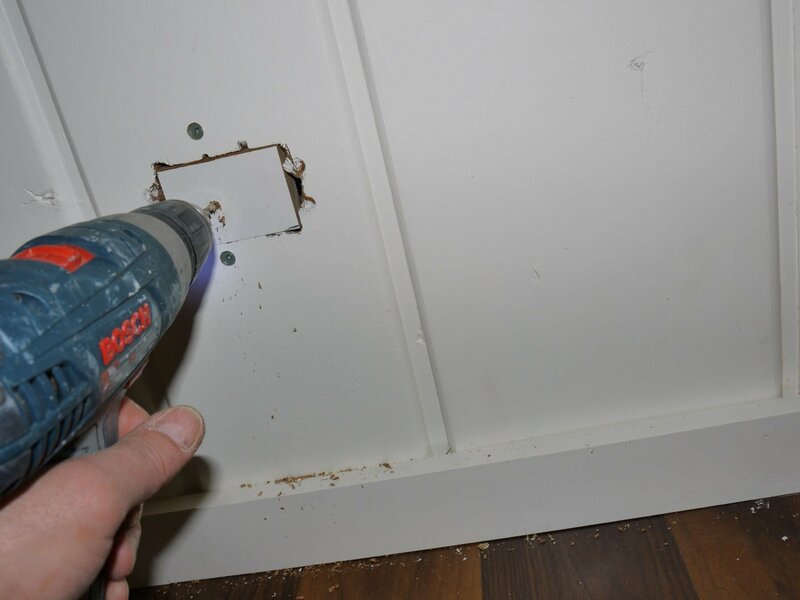 Securing wall patch material with a drywall screw. Overdrive the screw slightly to countersink of head to allow for coverage by filler. Clean patched hole and apply filler. 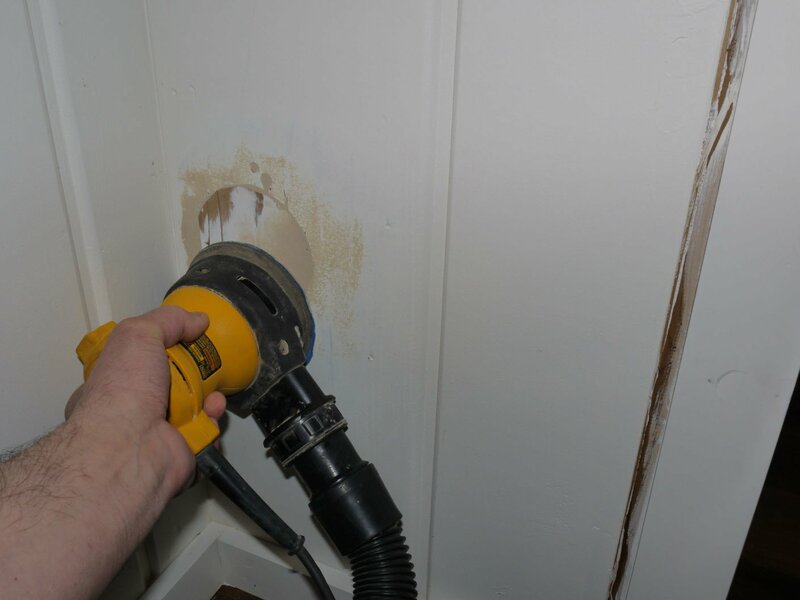 Clean patched hole with vacuum or duster to prepare for the filler material. 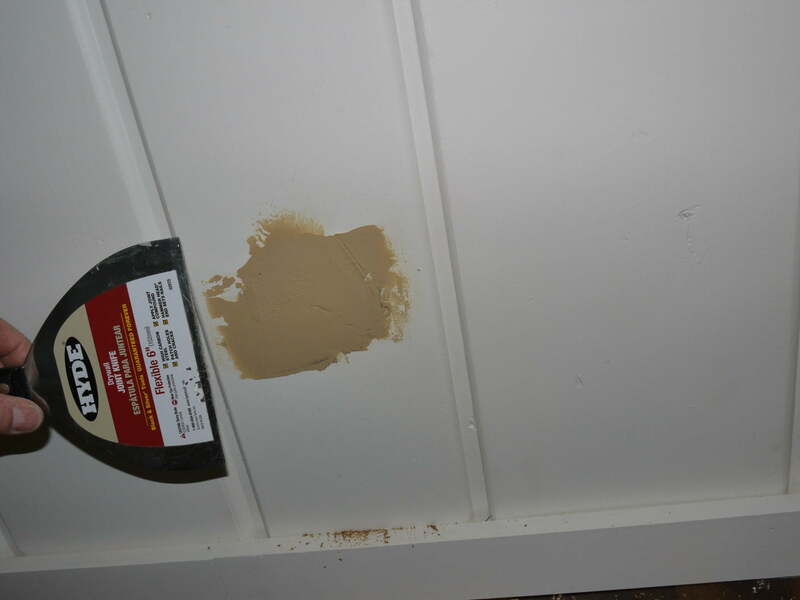 Using a putty knife or similar, apply the filler and smooth with larger flat knife (I used a drywall joint knife). Apply filler material (Plastic Wood in this case) with drywall knife and smooth to surface of wall. Allow filler material to dry, then sand wall repair flat. Allow the filler to dry completely (check specific recommendations of the product you are using for drying times) before sanding. I used Plastic Wood® by DAP, which is a solvent based filler that dries very quickly — a few hours. Avoid using premixed water-based fillers intended for small holes repairs (Elmers®, ZAR® wood patch, etc.) as they intended for very small holes and tend to crumble in this type of application. Once the filler is completely dry, sand the surface of the filler smooth to match the surface of the existing wall. I used a 4″ orbital disk sander with 120 grit paper. To help keep dust down, I attached a vacuum to the orbital sander. The vacuum attachment works great and helps hold the sander to the surface of the repair. 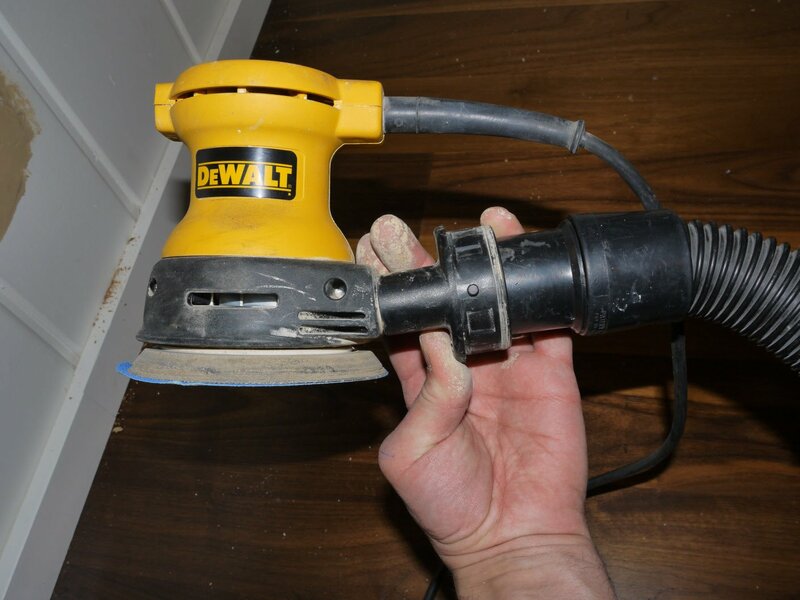 Using an orbital sander attached to a shop vacuum to flatten and finish the wall repair. Clean sanded repair and apply finish. After sanding, clean the repair thoroughly. Next, finish with paint or a finish to match that of the existing wall. 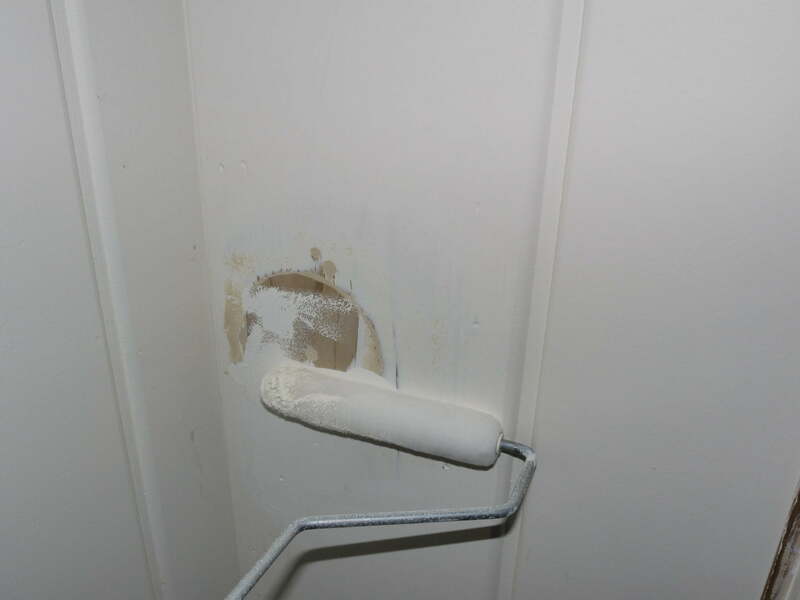 If painting, use the same applicator (brush, roller, specific roller cover, etc.) to match the existing finish. Complete wall repair with finish to match existing wall finish. Tools and supplies for the wall repair project. Drill a pilot hole for screws to be passed to secure plywood bracing. Secure plywood brace with drywall screws or similar. Plywood brace screwed in place. Drill pilot hole through patch and plywood brace. Plastic Wood solvent based wood filler. 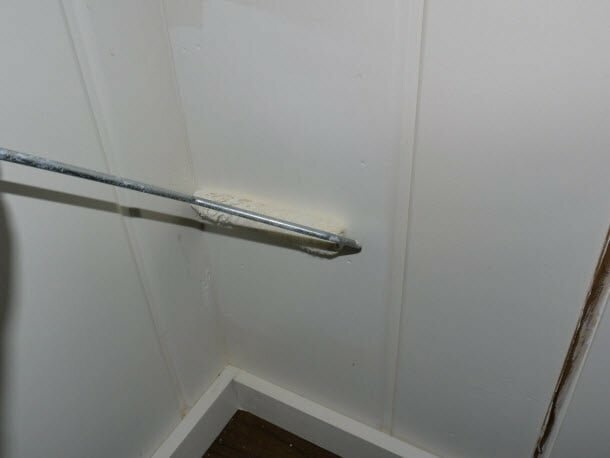 Wall repair using hole patch and plastic wood filler. Use wide taping knife or similar to level filler. Using an orbital sander is a big time saver. 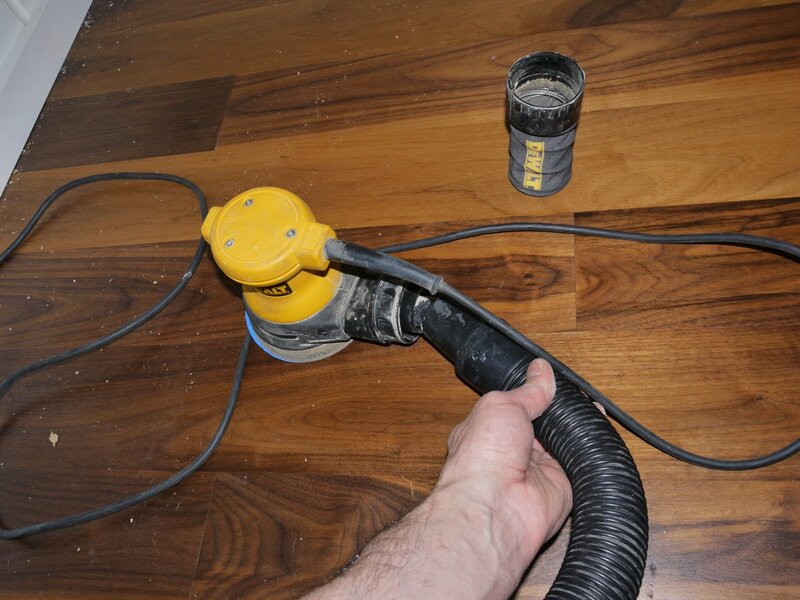 Use a vacuum to limit dust by removing the dust collector and attaching a vacuum hose. Smooth the filler using the orbital sander and 120 grit paper. Nearly finished sanding the repair smooth to the wall. Smooth wall repair ready for finish. Apply primer coat of paint. Apply finish coat to match existing wall finish.